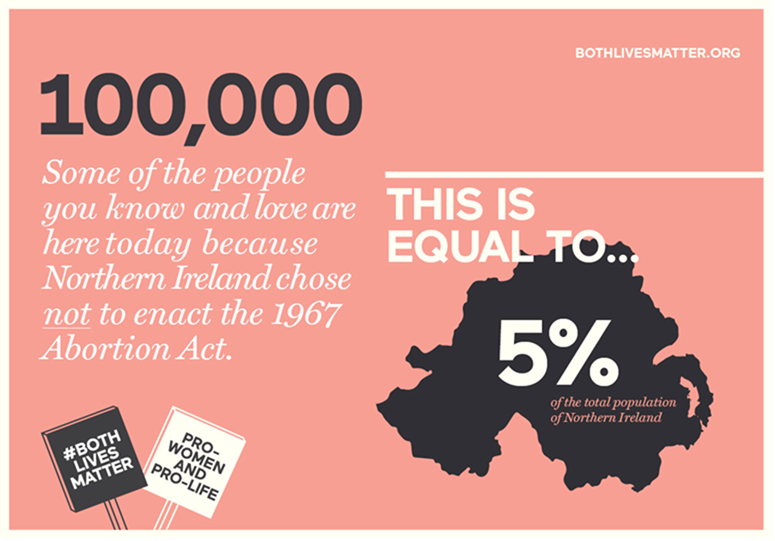 Both Lives Matter urges voters to take a stand for life in the Irish referendum on the 25th May. If the eighth amendment is repealed this will open the door basically to abortion on demand as is the case in the United Kingdom (except for Northern Ireland). I like the renewed emphasis of’ both lives matter as it clearly states that we are dealing with two lives, the life of the mother and the life of the unborn infant. It has been interesting to observe the posters on display in the Republic of Ireland and the simple message that the unborn child can yawn and kick at just nine weeks. Both lives matter was also the theme of a roadshow in the North of Ireland which my wife and I attended on 14th May in Belfast. It was an excellent presentation and included the story of Rebecca, a teenage mum (see maverick mum) whose four year old child Reuben is doing great and could easily have been a casualty of abortion. 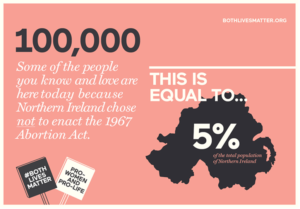 It is estimated that since the 1967 abortion act came into force in England that 100,000 lives have been saved in Northern Ireland as a result of there not being a similar act in place in Northern Ireland. It is important to remember that we are dealing with two lives and the life of the unborn child is a separate individual with two parents. it is not just an appendage of the mother. What about the psychological sequelae of abortion? Do these exist? Certainly. This is known by many anecdotes of those who suffer tremendous feelings of guilt and self – blame following abortion. A paper by Coleman, which reviews 22 other studies (British Journal of Psychiatry 2011) suggests that women who had had an abortion showed an 81% increased risk of mental health problems and as many as ten percent of mental health problems may have their roots in abortion. Certainly both lives matter. For my book on other mental health issues see Mindful of the Light-practical help and spiritual hope for mental health. The loneliness epidemic in the UK is a huge problem. Over half of those over the age of 75 live alone which is some two million people. Not that loneliness is just a problem of the elderly. As a church in Belfast we find that students, particularly those from overseas can be particularly lonely and isolated. Jo Cox worked hard on the loneliness epidemic before her untimely death and now a minister for loneliness, Tracey Crouch, has been appointed. It seems fairly certain that our individualistic society and loss of stable family structures have made the problem of loneliness far worse. What are the effects of loneliness? All of us will experience loneliness at times. It has been estimated that the effects of chronic loneliness can be as bad as smoking fifteen cigarettes a day. It can affect our behaviour, leading for example to problems with drugs and alcohol, as well as affecting our hearts, hormones and immune systems. Loneliness can a potent factor in depression and suicide, as well as leading to sleep loss, anxiety and paranoia. What can be done about it? Well the government initiative is welcome. Perhaps shutting down community resources and libraries needs more careful consideration. Having a funded strategy in place and working together with charities will help, and there is also much that can be done at the local level. In my previous work as a psychiatrist working with the elderly I spent a lot of time trying to encourage lonely and often vulnerable elderly people to join groups and clubs. The nature of the activity was not quite so important as just doing things with other people. And for those who are housebound, linking up willing volunteers with elderly persons can be a lifeline. We can, each one of us, become more alert to loneliness in our local areas. THE LONELY SOCIETY? report is a useful resource and MINDFUL OF THE LIGHT gives further information on mental health conditions that can be affected by the loneliness epidemic. Recently my wife and I visited Christchurch, New Zealand and were sorry to see the state of the Cathedral in the centre which was badly damaged in the earthquake of 22nd Feb. 2011. Many people struggle to understand such disasters and question whether God can be good if He allows such things to happen. Are there any answers? It seems we live in a far from perfect world. The Apostle Paul met this full on when He said, ‘For we know that all creation has been groaning as in the pains of childbirth right up to this present time.’ (Romans 8 v22) Paul then goes on to add that we too groan in our bodies. How can we understand this groaning, when we also read that when God looked on everything he had made that it was ‘very good’? (Genesis1v31) Did anything happen to turn ‘very good’ into ‘groaning’. In the Bible we read that when sin entered the world order a curse was put on creation itself. Genesis 3 v17 says, ‘Cursed is the ground because of you’. But what if science should show that earthquakes predated man? This is a more difficult question, but I suspect it may have to do with the presence of Lucifer, cast from God’s presence down to earth. There can be little doubt about the presence of evil in the world today. With the deaths of so many millions in the twentieth century as a result of Stalin, Hitler and many others who can seriously doubt it? There are some other questions to debate. Since we now know where the tectonic plates intersect, might it also be a good idea not to build cities there? Not that all earthquakes necessarily cause harm. An earthquake announced the resurrection of the Lord Jesus Christ. Also, when we consider His authority over the storms at sea, then we can also begin to believe that we do not always have to be at the mercy of such phenomena. Jesus after quieting the storm rebukes His disciples for their lack of faith. Maybe this was a storm stirred up by evil powers to destroy Christ and His disciples! Whatever, the word of Christ quieted the storm and perhaps we who believe in Christ should rise up more strongly when we recognise the presence of evil, even in so- called natural phenomena. In my book, FINDING THE YES IN THE MESS, I talk in more detail about ways we can move forward in understanding suffering and pain in our lives. Understanding more does help us to be more resilient. We were never promised a trouble free existence. It is also helpful to reflect on the immense suffering undergone by Christ Himself for us. This can help us see suffering in perspective. There is beauty too in seeing the ways Christ brought relief from suffering in the Gospel accounts, and we His followers can bring some of His healing into this needy and groaning world. And maybe we will find further ways of understanding earthquakes! A survey carried out by the Prince’s Trust was reported on today in the Belfast Telegraph.. It reports that 44 percent of young people say they have had a mental health problem. Stress was very high affecting 68 per cent. Anxiety was very common and 60 per cent said that they always or commonly felt anxious. Feelings of hopelessness were present in almost a third . He also emphasised mental health education and the importance of developing resilience. He mentioned the need for further resources. The Belfast Telegraph article goes on to discuss the need for young people with mental health problems in Northern Ireland to have clear aims and objectives in life, as well as job opportunities. Eleven percent of young people are not in employment, education or training. Mr Stace, UK Chief Executive at The Prince’s Trust, said that alarm bells should ring because so many young people in Northern Ireland and across the UK feel more despondent about their emotional health than ever before. I was speaking, with others, recently at a seminar on mental health in young people at St Mark’s church Dublin. I mentioned the importance of mental health education and we discussed resilience. The church and mental health professionals need to work together on mental health issues. Too often psychiatrists have sided with Freud who thought that God was an illusion. On the other hand the church has often not understood mental illness well and has sometimes taught that mental illness is a result of lack of spirituality, or sin, or some other cause, thus loading the individual with guilt on top of the mental health problem. There is however good evidence that religious practice is protective of mental health and Harold Koenig, one of the key leaders in this field, will shortly be speaking at a conference on Theology, Spirituality and Mental Health on May 12th in Belfast, and the details are under my ‘Talks’ blog on this website. For my own part, as a retired psychiatrist and Christian Pastor, I have been doing talks for the general public on mental health issues and how faith can help. My book,’ Mindful of the Light-practical hope and spiritual help for mental health,’ is a synopsis of some of the talks I have been doing. For example, I have a chapter on Anxiety and a corresponding chapter on Spiritual Help in Anxiety. Spiritual help, as well as help from mental health professionals, teachers and others should be on the agenda to help the young people of Northern Ireland with mental health problems. Bridges of despair can become bridges of hope. The story of Kevin Hines is most illuminating. He was diagnosed with bipolar affective disorder at the age of 17. He felt alone and without hope.. When aged 19 he could feel nothing but intense emotional pain and after leaving a suicide note decided to jump off the Golden Gate Bridge in San Francisco. In an article entitled, Hey kid are you O.K? -a story of suicide survived (Advances in Psychiatric Treatment 2013 vol 19, 292-294) he gives a deeply moving account of his survival from suicide. In answer to his cry , a sea lion nudged him to the surface until the rescue boat arrived and his life was spared. Kevin now travels widely talking of his experiences and also emphasising the need for structure in our lives as a way of helping our mental health. He also says that if anyone had asked him before he jumped if he was O.K. then he probably would have told them the whole story and would not have jumped. The bridge of despair became a bridge of hope. Intense suicidal thoughts may be short – lived. Rescue teams on the Golden Gate Bridge have helped many at the point of suicide. A twenty five year survey showed that ninety percent of those who were saved by the teams never died by suicide. Rescue teams and barriers on bridges are certainly helpful. Suicide is a big problem where I am writing from in Belfast, as I mentioned in my last article. The work of Professor Patricia Casey (Psychiatrist from Dublin) shows that those who practise a religious faith have a lower rate of suicide. In reflecting on the Easter story we can remind ourselves of several things. Firstly, in the death of Jesus Christ we can see that we are each very loved and very special, as He carries away the burden of our sin and proclaims the availability of forgiveness for us. So the cross and the resurrection become a bridge of hope for our lives and a way of reconnecting our lives with God. In my book, Mindful of the Light-practical help and spiritual hope for mental health, I discuss several mental health topics and how the Christian Faith can help us in these areas, as well as discussing the role of medication and other forms of treatment. Bridges of despair can become bridges of hope. Suicides among teenagers in Belfast are a big problem. It is a huge tragedy when a teenager takes their own lives. Northern Ireland has had the largest suicide rate in the UK for the last few years. In West Belfast in 2015 the suicide rate doubled in young people from the previous year. What are the special problems faced by young people? Many teenagers have been struggling with low mood and anxiety. Cyber bullying can increase suicidal thoughts and behaviour. Drugs and alcohol add to the problems. Between one third and one half of all suicides involve alcohol. Removal of normal inhibitions can follow alcohol and drug abuse. The actual suicide is often impulsive following a stressful event. Many will have made a previous suicidal attempt. Suicide can be precipitated by news of another person’s suicide. There has been much research to show that those who regularly practice a religious faith have lower suicide rates than those who do not and I will hope to discuss this in a future article. The church I belong to (Every Nation Church Belfast) is keen to reach out to teenagers. Building resilience in the lives of young people and helping them connect to a religious basis for life can be important factors in helping to prevent TEENAGE SUICIDES IN BELFAST.